- (1) Use open front for ram air effect. - (2) Open back as heat extractor. - (3) Closes completely when required. - Integrated grille prevents debris ingress. - Finish: Steel - Black enamel. - Dimensions: 13 + inch x 7 + inch. - Easy installation. (Use gasket as template for hole cutting). Foam gasket provided. - Also available in aluminum. 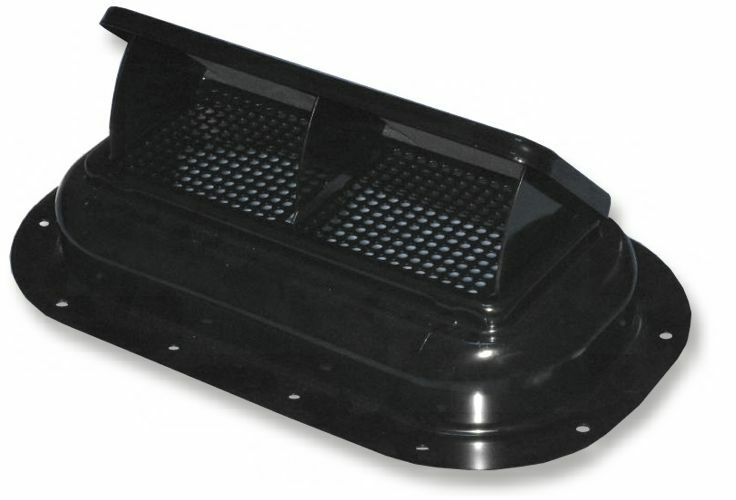 - The multi-functional ram air hood vent is a worthwhile accessory to your off-road rig. In the harsh environment on off-road trails heat generated by the engine needs to flow out of the engine compartment. To achieve this effect simply open the hood vent to the back. The air blowing through the front grille into the engine compartment gets vented out through the hood vent allowing the engine to maintain a cooler temperature. For on-road driving open the vent to the front and enjoy the ram air function it provides. The integrated grille prevents debris and leaves from entering the engine compartment. And in cold weather where necessary simply close the vent until needed.